I think this website needs a few improvements. I would remove all subsections. The main point of this is to have more visible activity on as much sections as possible. Also, I'd add some content, for possible new users (for example, Starbomb album tracks in the multimedia zone, a discussion on how should the next Smash Bros. game should be in general discussions, a simple project (like, dunno, a M.U.G.E.N. character or stage? ), etc.). Then, after a few weeks of waiting, I would send an e-mail to every single registered member. They'd come back, at least for a few hours. A few hours that can be GLORIOUS with a little work and presence. I think there still is potential for this website. We may not be a young and growing audience, but we have some seriously great spriters, M.U.G.E.N. coders and awesome 2D graphics designer in our cast. BTW, I started working on a Node.js version of the website, because I don't wanna see it die. I may not finish it, but I'll try as hard as I can to get a prototype. You'll have to wait for Mbisme to visit. It's not too often so be patient, but I'm sure he'd love to help. Now prototype the sh*t out of BW. An hour and a half of work, using Node.js, Express.js for routing and Bootstrap/jQuery for front-end style and responsiveness. A lot of people are too busy to sit on the computer anymore so I think a mobile version will bring some people back for sure. Looking good so far, mate. Just like the real thing. 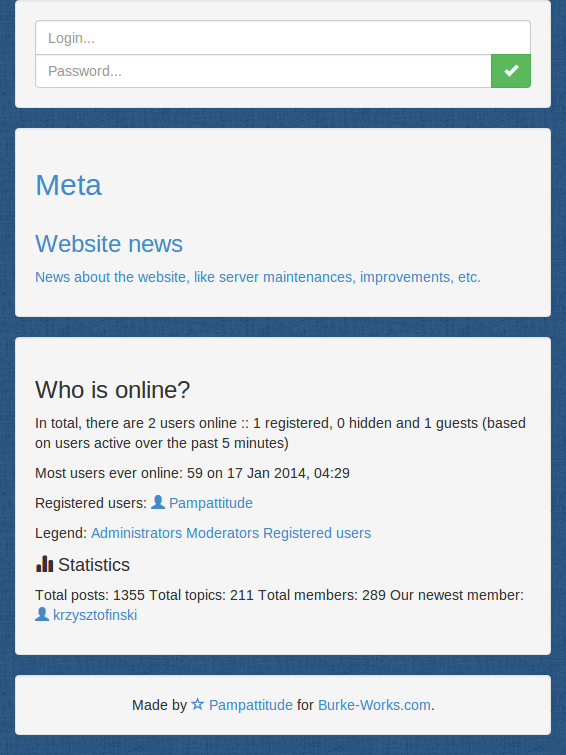 If you can theme for phpbb (which im not planning on changing the forum software unless there is a large reason for me to) then I would be more then happy to switch to a theme that you want to use. However, unless if you have something ready in the next 3 days then it will prolly be 3 weeks before i can do anything. Next week I am having surgery and wont be able to use the computer for around a week after that. If you can contact me on MSN/WLM that would be the easiest way. If it's anything like invisionfree, I can change the theme myself. Or if it's something you think you could teach easily, just message me and I'll change it in your absence. I'd also be happy to perform any other changes, given your approval. Well, no, I don't, and I sincerely don't intend to. - You might get users willing to maintain the website because people lo~ve Node.js. I highlighted the word "trendy" because it is crucial. - newcomers, and these don't come too because this website lacks content. I may sound like a douche, but I believe this website needs way more than a new design. It lacks a mobile version, has too much sections and too few content, does not feel welcoming for a newcomer, and the list goes on. If we ever wish to make this website cool again, we need something new. Something adapted to current trends, filled with projects, unique profiles and committed people. I am merely proposing the first step. And I am not saying I will recreate this website. I will try, but I can't assume I will ever finish it. However, didn't you say we needed projects? Here is my proposition: in three weeks, after your surgery and after you rest, I will probably have a functional prototype. If you like it, we can think about migrating the DB then the server on this new version. Else, well, there is no drawback. Everything stays the same. ok, going to go through your reply in chunks to make sure i cover everything. ok, this is fair enough. - Bootstrap: bootstrap is just a web development api, that said i have no issue with it. - Bootstrap: you're right, this theme is obsolete, and very broken on both desktops and mobile devices. - Node.js: this is a no-go. i MUST run apache for my webserver because (although you might not believe it) i have other websites that are actively used that i host that require specialty setups needed through apache. and from what i can tell i cant use both node and apache for the webserver. in addition to this, node doesn't support php which pretty much every website i host uses. - Node.js: trendy is something i dont care about. maybe that is an issue, but see above for the real problem with node. - MongoDB: i already stated what i think about something being "trendy." i also see no reason to use mongo over mysql (which is what i use now). but at the same time i think i can run them side by side so i see no issue with using mongo either. - I'm willing to do it for free, on my spare time, and can come up with a prototype by next week because I love BW; that is great, i dont have the resources to be able to pay someone for this website. but i think making a prototype while there are issues to be resolved would be a waste of time. - I will try as hard as I can to migrate old data to this revisited version, and that includes: stats, posts / threads and user accounts (that may be the hardest part... how are the passwords encrypted in DB? ); passwords are stored just in default phpbb format, which i believe is salted-SHA hashes. - You might get users willing to maintain the website because people lo~ve Node.js. see above. Pampattitude wrote: I highlighted the word "trendy" because it is crucial. i think trendy might be the wrong word for this. for both audiences you basically state the problem is lack of content/activity. this is true, it is why i dont do anything, there is nothing to do. but rather then make the website trendy, i think the website should be functional and have a real purpose. the problem before was the website used to be trendy, then mugen-based games pretty much died out and people lost interest in the site. Im not saying it is a bad thing to be trendy, but in 5 years when the trend ends what happens then? I think we need a more clear-cut purpose then what we currently have. Pampattitude wrote: I may sound like a douche, but I believe this website needs way more than a new design. It lacks a mobile version, has too much sections and too few content, does not feel welcoming for a newcomer, and the list goes on. go ahead and sound like a douche, sometimes thats how the truth is. but from what i gather with what has been stated thus-far you want to change the internal infrastructure of my server (which i cant due for various reasons) and you want a mobile version of the site. im fine with a mobile version, and agree that it is really needed now, but i am quite happy with phpbb, apache, and mysql. the software works, and being in the server admin field of work like me, if it works as intended then there is no reason to change it, and switching to node/mongo i have my doubts that what i have will still work. find me proof that with node i can still use php, mysql, virtual domains for ~10 websites, custom rewrite rules, etc and then i would consider it. but at this point im not convinced. Pampattitude wrote: And I am not saying I will recreate this website. I will try, but I can't assume I will ever finish it. However, didn't you say we needed projects? not much to say here. i believe i have addressed everything above.